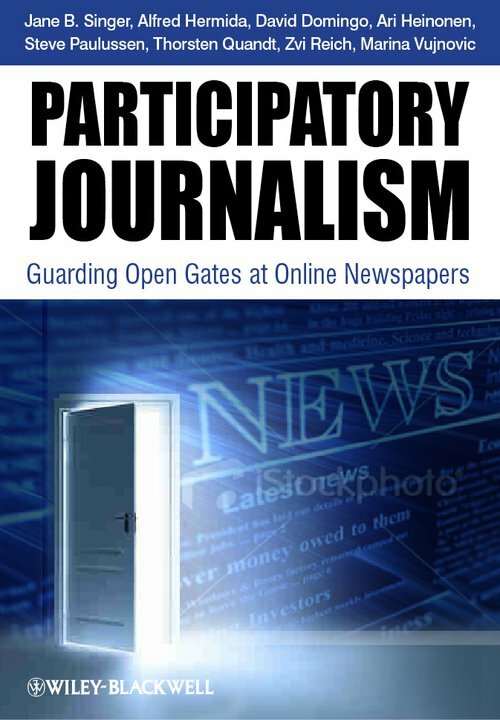 Participatory Journalism: Guarding Open Gates at Online Newspapers offers fascinating insights into how journalists in Western democracies are thinking about, and dealing with, the inclusion of content produced and published by the public. Recent years have seen a dramatic change in the relationship between online media and the ‘audience’, and user–generated content is a common feature of news websites. Control over the contents of the media space, once held by traditional news outlets, today is shared by bloggers and other social media participants. Such an environment requires a significant conceptual and practical shift for journalists, who face a rapid and radical decline in their power to oversee the flow of information. The ability to productively incorporate user contributions within traditional media spaces is becoming a vital skill. This book is based on a collaborative research project by a team of journalism scholars from Europe, North America and Israel. Participatory Journalism goes right to the heart of what journalists do, what journalism is, and what role both traditional and new information providers play in a contemporary democratic society that has gone digital. Published by Wiley-Blackwell, the book is available from April 15 in the UK and May 2 in the US. 1. Introduction: Sharing the Road. Section One: The Impact of Participatory Journalism. 2. Mechanisms of Participation: How Audience Options Shape the Conversation (Alfred Hermida). 3. The Journalist’s Relationship with Users: New Dimensions to Conventional Roles (Ari Heinonen). 4. Inside the Newsroom: Journalists’ Motivations and Organizational Structures (Steve Paulussen). 5. Managing Audience Participation: Practices, Workflows and Strategies (David Domingo). 6. User Comments: The Transformation of Participatory Space (Zvi Reich). Section Three: Issues and Implications. 7. Taking Responsibility: Legal and Ethical Issues in Participatory Journalism (Jane B. Singer). 8. Participatory Journalism in the Marketplace: Economic Motivations behind the Practices (Marina Vujnovic). 9. 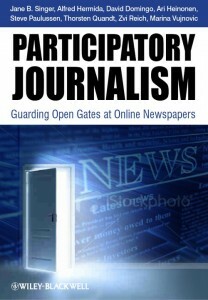 Understanding a New Phenomenon: The Significance of Participatory Journalism (Thorsten Quandt). 10. Fluid Spaces, Fluid Journalism: The Role of the “Active Recipient” in Participatory Journalism (Alfred Hermida). David Domingo is a senior lecturer in online journalism at the Department of Communication Studies of Universitat Rovira i Virgili in Tarragona, Spain. Domingo, who has a Ph.D. in Journalism from the Universitat Autònoma de Barcelona, was a doctoral fellow at the University of Tampere (2004) and visiting assistant professor at the University of Iowa (2007-2008). His research interests include online journalists’ professional ideology and work routines, as well as the dynamics of innovations such as participatory journalism and convergence. He is co-editor, with Chris Paterson, of Making Online News: The Ethnography of New Media Production (Peter Lang, 2008). Zvi Reich, Ph.D., is a former journalist and a researcher in journalism studies at the Department of Communication, Ben Gurion University of the Negev, Israel. His book, Sourcing the News, was published by Hampton Press in 2009. Reich’s research interests focus on online news, sociology of news, the relations between reporters and sources, authorship in journalism and the use of communication technologies in journalism. Two of his papers have won the top three papers prize of the Journalism Studies Division at ICA. Other research has appeared in Journalism Studies, Journalism & Mass Communication Quarterly and Journalism. He is a member of the editorial board of Journalism Practice. Carrie Brown, assistant professor at the University of Memphis, Journalism, 13(3) 388–394, April 2012. Mark Hamilton, journalism instructor at Kwantlen Polytechnic University, Richmond, BC, Canada, via Twitter.